Data through November 2010, released January 25 by Standard & Poor’s for its S&P/Case-Shiller Home Price Index, the leading measure of US home prices, show a deceleration in the annual growth rates in 17 of the 20 Metropolitan Statistical Areas (MSAs) and the 10- and 20-City Composites compared to what was reported for October. 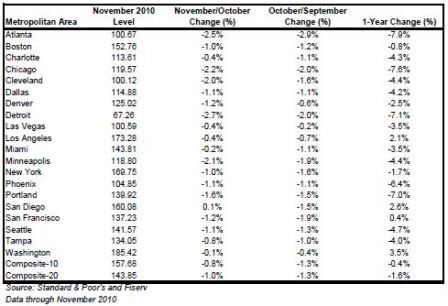 The 10-City Composite was down 0.4% and the 20-City Composite fell 1.6% from November 2009 levels. Home prices fell in 19 of 20 MSAs and both Composites were lower in November from their October levels. In November, only four MSAs – Los Angeles, San Diego, San Francisco and Washington DC – showed year-over-year gains. The Composite indices remain above their spring 2009 lows; however, nine markets – Atlanta, Charlotte, Chicago, Detroit, Las Vegas, Miami, Portland, Seattle and Tampa – hit their lowest levels since home prices peaked in 2006 and 2007, meaning that average home prices in those markets have fallen even further than the lows set in the spring of 2009. The chart depicts the annual returns of the 10-City and the 20-City Composite Home Price Indices. In November 2010, the 10-City and 20-City Composites recorded annual returns of -0.4% and -1.6%, respectively. November was the sixth consecutive month where the annual growth rates moderated from their prior month’s pace. Since May 2010, the housing market has experienced an unambiguous deceleration in home price returns. The 10-City Composite has reentered negative territory with a -0.4% annual growth rate in November, versus the +5.4% reported six months prior in May, and the 20-City Composite was down 1.6% in November versus its +4.6% May print. “With these numbers more analysts will be calling for a double-dip in home prices. Let’s take a moment to define a double-dip as seeing the 10- and 20-City Composites set new post-peak lows. The series are now only 4.8% and 3.3% above their April 2009 lows, suggesting that a double-dip could be confirmed before Spring. Certainly nine cities setting new lows, and with the only positive news concentrated in southern California and Washington DC, the data point to weakness in home prices,” says David M. Blitzer, Chairman of the Index Committee at Standard & Poor’s. “With an annual growth rate of +3.5% in November, Washington DC was the strongest market, but still well below the +7.7% annual rate of growth seen in May 2010. The only city with a gain in November was San Diego, up a scant 0.1%. While San Diego, Los Angeles and San Francisco are still ahead from November 2009, their annual rates are shrinking in recent months. The chart above shows the index levels for the 10-City and 20-City Composite Indices. As of November 2010, average home prices across the United States are back to the levels where they were in latter half of 2003. Measured from June/July 2006 through November 2010, the peak-to-current decline for both the 10-City Composite and 20-City Composite is -30.3%, improvements from their April 2009 trough are +4.8% and +3.3%, respectively. The 10 City Composite was down 0.8% and the 20-City Composite fell by 1.0% in November. 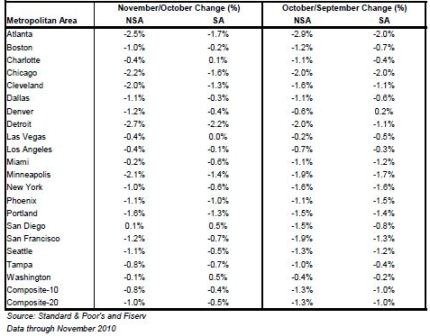 Nineteen of 20 of the metro areas also declined in November; San Diego was up just 0.1%. Thirteen of the MSAs were down by 1.0% or more in November, with Detroit posting the largest decline of 2.7%. As of November 2010, Las Vegas is down 57.2% from its peak in August 2006; Phoenix is down 53.9% from its peak in June 2006 and Miami is down 48.8% from its peak on December 2006. Since its launch in early 2006, the S&P/Case-Shiller Home Price Indices have published, and the markets have followed and reported on, the non-seasonally adjusted data set used in the headline indices. For analytical purposes, Standard & Poor’s publishes a seasonally adjusted data set covered in the headline indices, as well as for the 17 of 20 markets with tiered price indices and the five condo markets that are tracked. A summary of the monthly changes using the seasonally adjusted (SA) and non-seasonally adjusted (NSA) data can be found in the table below. The S&P/Case-Shiller Home Price Indices are published on the last Tuesday of each month at 9:00 am ET. They are constructed to accurately track the price path of typical single-family homes located in each metropolitan area provided. Each index combines matched price pairs for thousands of individual houses from the available universe of arms-length sales data. 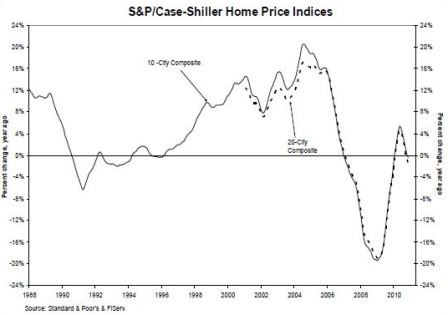 The S&P/Case-Shiller National US Home Price Index tracks the value of single-family housing within the United States. The index is a composite of single-family home price indices for the nine US Census divisions and is calculated quarterly. The S&P/Case-Shiller Composite of 10 Home Price Index is a value-weighted average of the 10 original metro area indices. 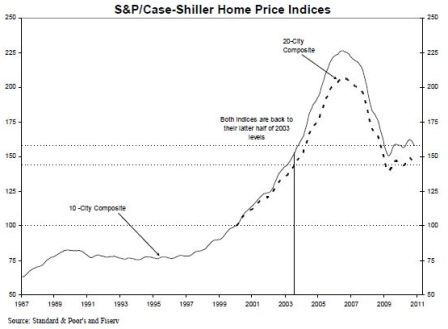 The S&P/Case-Shiller Composite of 20 Home Price Index is a value-weighted average of the 20 metro area indices. The indices have a base value of 100 in January 2000; thus, for example, a current index value of 150 translates to a 50% appreciation rate since January 2000 for a typical home located within the subject market. These indices are generated and published under agreements between Standard & Poor’s and Fiserv, Inc. The S&P/Case-Shiller Home Price Indices are produced by Fiserv, Inc. In addition to the S&P/Case-Shiller Home Price Indices, Fiserv also offers home price index sets covering thousands of zip codes, counties, metro areas, and state markets. The indices, published by Standard & Poor’s, represent just a small subset of the broader data available through Fiserv. For more information about S&P Indices, please visit http://www.standardandpoors.com/indices. S&P Indices, the world’s leading index provider, maintains a wide variety of investable and benchmark indices to meet an array of investor needs. Over $1.25 trillion is directly indexed to Standard & Poor’s family of indices, which includes the S&P 500, the world’s most followed stock market index, the S&P/Case-Shiller Home Price Indices, the leading measure of US home prices, the S&P Global BMI, an index with approximately 11,000 constituents, the S&P GSCI, the industry’s most closely watched commodities index, and the S&P National AMT-Free Municipal Bond Index, the premier investable index for US municipal bonds. Visit www.standardandpoors.com/indices for more information. Standard & Poor’s does not sponsor, endorse, sell or promote any S&P index-based investment product.